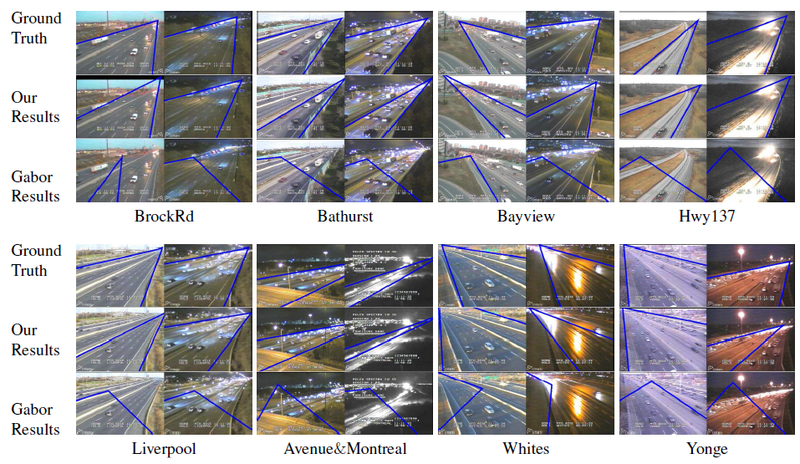 This work proposes a new technique to detect the dominant road boundary and estimate the vanishing point in images captured by traffic cameras under a wide range of lighting and environmental conditions. The technique starts by dividing each input image (a) into homogeneous regions through superpixel segmentation (b). Then, the technique performs polygon approximation on superpixel contours to get edges (c). The edges are clustered using bottom up hierarchical clustering (d, e, f) and statistical measures are used to identify the top-ranked clusters; each cluster represents a candidate road boundary in the image (g). The top-ranked clusters are then paired and filtered according to image perspective and road-activity (h). Finally, the technique returns the top-ranked cluster pair as the dominant road boundary.